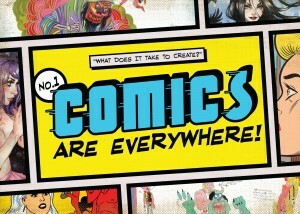 SAN DIEGO-BASED DOCUMENTARY “COMICS ARE EVERYWHERE” AWARDED CREATIVE CATALYST FUND AND LAUNCHES KICKSTARTER CAMPAIGN IN SUMMER 2013 : COMICS ARE EVERYWHERE! San Diego, CA. - COMICS ARE EVERYWHERE, a feature-length documentary about comics, kicks off the summer in style with the launch of its Kickstarter campaign, set to go live on July 18th to coincide with the opening of the 2013 Comic-Con International. Contributors can expect to receive movie and comic-book paraphernalia ranging from autographed postcards, and limited-edition books signed by artists JJ Villard, Danni Shinya Luo, and David Lloyd, signed original art and even associate producing credits for larger contributions. In production since 2010 and filmed against the backdrop of various comic conventions such as the 2010 and 2011 Comic-Con, San Francisco’s Alternative Press Expo (APE), and artists’ studios, the film looks at select comic creators’ respective creative processes – in and out of comics – and asks, what does it take to create? This year, the documentary’s production is set to go out of state as the filmmakers plan to interview eclectic artists around the country. Comics Are Everywhere has recently gained fiscal sponsorship from San Diego’s Pacific-Arts Movement and the film’s writer-director Neil Kendricks was awarded the 2013-2014 Creative Catalyst Fund/ Individual Artist’s Fellowship. Be sure to check back and bookmark us for future posts at the film’s Web site: www.comicsareeverywhere.com.